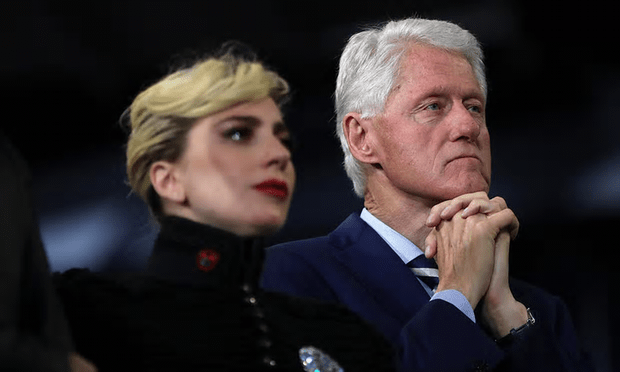 Bill Clinton at a campaign rally at North Carolina State University – with Lady Gaga, whose stage name is highly appropriate to the comments attributed to the ex-president [Image: Justin Sullivan/Getty Images]. Ex-President Bill Clinton’s comments, made at a speech last October, have to be taken in the context of the US election taking place at the moment. If I recall correctly, Bernie Sanders was a candidate for the Democrat nomination at the time, and Mr Corbyn has expressed support for him in the past. Mr Sanders was the closest the US has come to nominating a socialist presidential candidate (although that’s not saying much). Also, of course, Donald Trump was seeking the Republican nomination, which he eventually secured. And Mr Clinton was speaking in support of his own wife Hillary. But he has also undermined himself by referring to a conversation with a former Northern Ireland Secretary who praised Mrs Clinton for helping him through a different period for that part of the UK. Mr Clinton seems to have assumed it was a cabinet minister in David Cameron’s Coalition government but, according to The Guardian, it is more likely to have been Shaun Woodward, who was NI secretary under Gordon Brown. So Mr Clinton seems more than a little confused and Jeremy Corbyn’s office is probably right to ignore what he says. Jeremy Corbyn was chosen as Labour’s leader because he was “the maddest person in the room”, former US President Bill Clinton has declared. The explosive remarks, to a private dinner of wealthy donors in October 2015, show the former President comparing Corbyn to leaders of anti-austerity parties like Greece’s Syriza. The documents – part of a raft of leaks designed to undermine Hillary Clinton’s Presidential bid – reveal that he also attacked Ed Miliband for being too left wing for British voters. When contacted by HuffPost UK, Corbyn’s office refused to comment on the remarks. Corbyn has in the past voiced his support for Bernie Sanders, and claimed that he had helped shift Hillary leftwards on issues such as free trade.